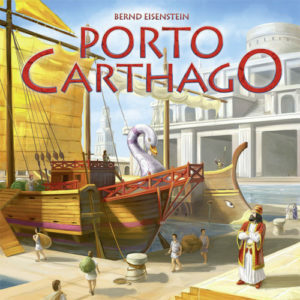 Players represent senators in ancient carthage. It was one of the most important sea- and economic power. Players try to make a good business sending their servants to different places. They deliver goods onto the incoming ships and send out their own ships to raise their capital and get some tradingpoints, which will show the most influential merchant. The major goal is to increase the influence in the palace to have the most servants in the palace, but beware of the intrigue of the opponents! The artwork was done by Oliver Schlemmer (Fresco). The material ist completely language independent. German and English rules are included. » German rules (1,99 MB). » English rules (2,02 MB). » French rules (2 MB). » Hungarian rules (3,10 MB) Thanks a lot Károly Dudás!